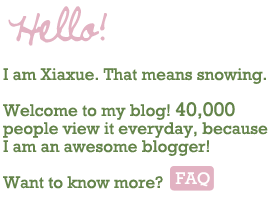 Xiaxue.blogspot.com - Everyone's reading it. : Fina-freaking-lly!!! You have to come back tomorrow. All that's left of the new template is that my designer adds in his own credits. And it is so beautiful, it will blow your mind off. That's right, it's 740am now, and I have JUST FINISHED DOING IT.